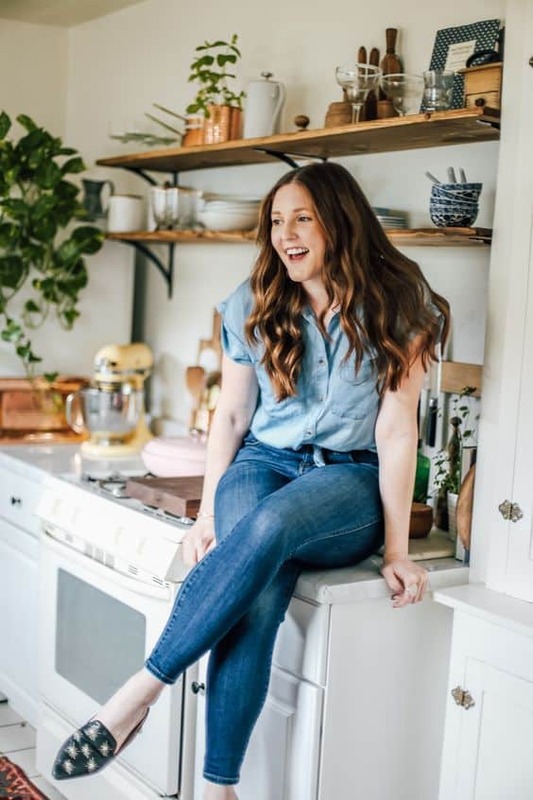 If you guys follow me along on instagram you know we chatted a ton about this post in a little ‘behind the scenes styling’ on instagram stories last week. I walked you through a glimpse of my shooting space and a few things I do to set the mood and story behind every photo! Needless to say the response was amazing and it turns out everyone is down for a little lesson here and there! I promise to do more of this as it seemed to help a ton of you! In college I weighed out a ton of different career options and ‘teacher’ was one of them for a VERY brief period. You see, I have like a deficieny in patience in my personality which makes me equal parts horrible and a go getter but it’s mostly a bad quality. 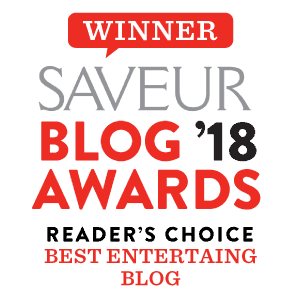 I know you have to have an incredible amount with teaching but talking about styling and photography with my readers feels more like ‘guiding’! Which is way easier to grasp and execute! During the some of the behind the scenes we also chatted about mood and story of a photo! Which is an absolute real thing! People always ask me where I come up with inspiration for photos and recipes! It’s a process really. Most of the time I look a few months out and always see what kind of holidays are coming up (Christmas, pie day (3.14), cinco de mayo, etc.) and tailor a good chunk of content toward that. I always make a mood board for the season and visually save what I’m loving (basically a giant day on pinterest and looking at magazines). Then I break it down by season! 2. They are styled with spring colors and light pastel tones to match the season! 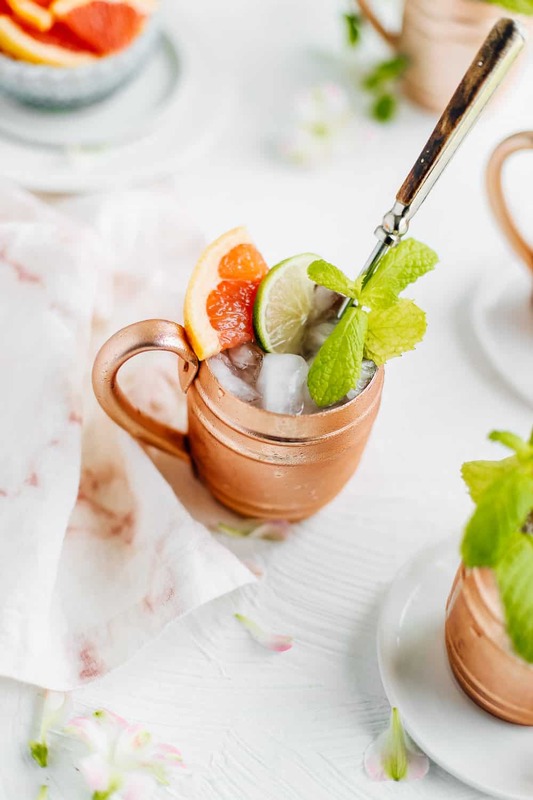 Moscow mules are a classic cocktail recipe but some ingredients can be interchanged and swapped out to better match the season. 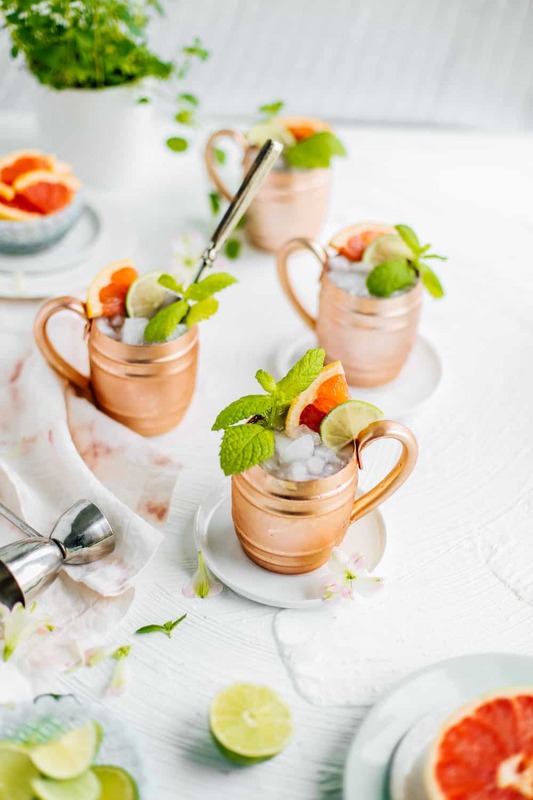 Last Autumn we featured a spiced harvest Moscow mule, which has the same principal! We put in Autumn season fruits and styled with more farmstyle props for that cozy, fall feel! For this recipe I made sure to garnish with tons of fresh mint (because spring is notorious for growing fresh herbs!) and used bright colored grapefruit and lime slices. Okay now lets chat about styling the photo! This means plates, glassware, linens, backgrounds, props, all the things! 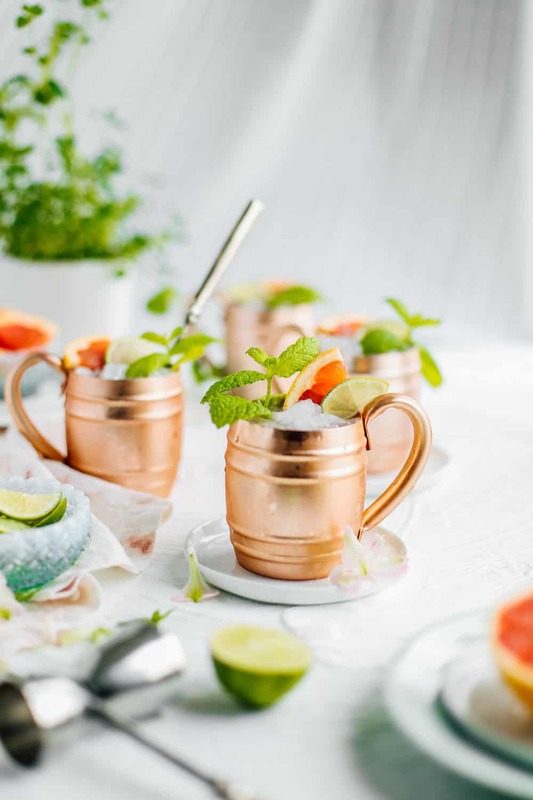 Today we are using a copper mug to further deepen the ‘Moscow mule’ story. I also used clean white backgrounds with some fresh herbs for more seasonal interest. I am using pastel bowls (to enhance the spring theme!) filled with items in the recipe. The linens used in the photo are white and pale pink to keep the light and airy feel. A wooden background and darker linen would drastically change the look and feel of the photo! Last but not least I sprinkled a few flower petals and mint leaves to bring in some more interest and texture. You want to make sure when you’re styling your photo that you have a little white/negative space through out the photo so your eye has somewhere to rest. In a few weeks I’ll be sharing a styling guide on the site that will have tons more tips and tricks for all things PROPS! Keep your eye out and enjoy this recipe! Have a great weekend! 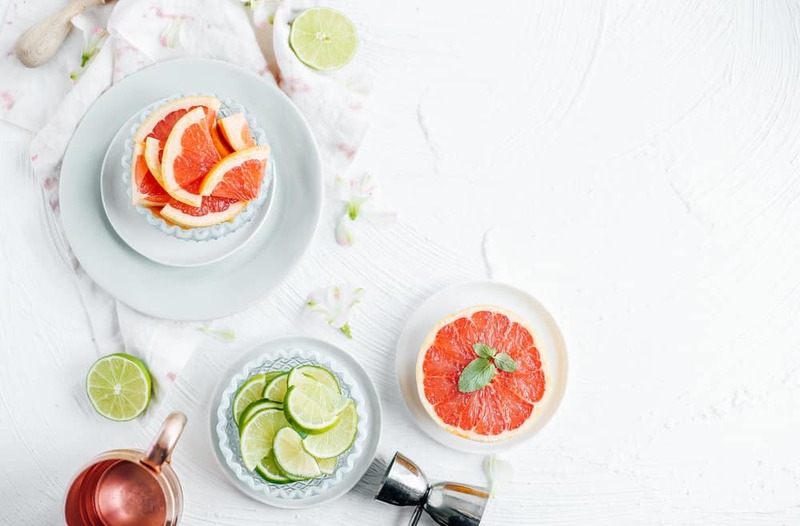 Lime slices, grapefruit slices and mint sprigs for garnish! 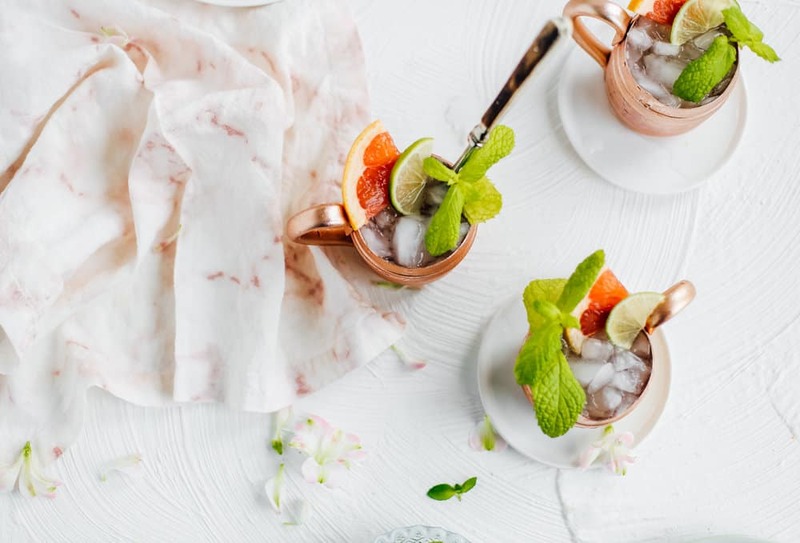 Fill a glass or copper mug with crushed ice. Pour grapefruit juice, lime juice, mint leaves and vodka in and stir well. Fill the rest of the glass with ginger beer and gently stir. 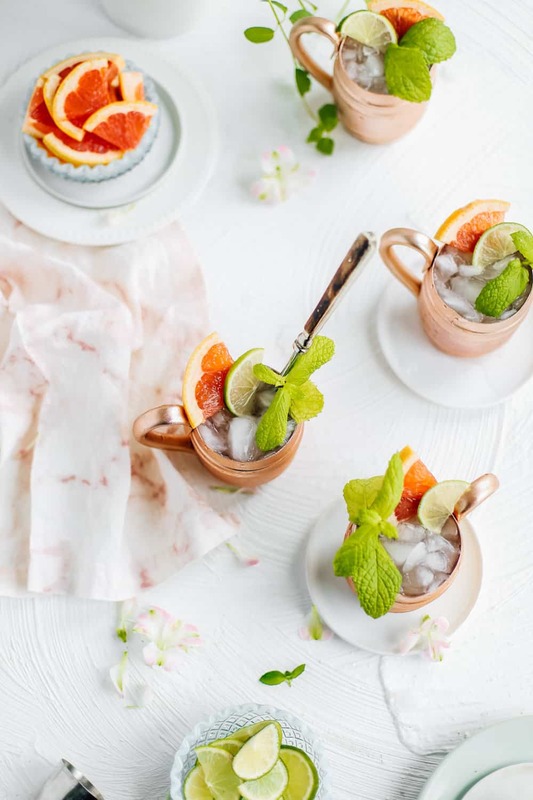 Garnish with citrus slices and fresh mint for the perfect vibrant spring cocktail! i freaking LOVE your styling! serious inspo for my own styling! i love that every photo you do tells a story! i can image you’d have an epic prop stash! ha ha, i am a teacher but I’ve always maintained i LOVE teaching, but hate being a teacher in a typical classroom setting. one day i’d love to host my own backyard cooking school or something like that!